Tall Coreopsis is flowering! Coreopsis tripteris. I planted this in two locations this year. The first I bought from an online nursery as a bare root plant and it's gotten to be about 4' tall. No flowers open yet but there are buds. The second location was from a 3 gallon pot I found among the massive inventory Popes' Gardens has. They're a local nursery about the size of a farm that sells at least one of everything. I wish they stocked more natives but they have such a huge selection that it's easy to overlook things like Tall Coreopsis. I kind of jumped up and gasped when I saw they sell it. The one from their nursery is flowering now, with it's blooms pictured above. To be more accurate, 3' high isn't very tall at all but that should change next year. An unfortunate side effect of nursery grown can be stressed roots, either from growing in a pot to long or being divided off an adult plant. This stress limits the natural growth and disrupts the normal cycle of growing. This isn't necessarily bad for the plant though, it encourages early flowering is all. Next year it should grow to a more normal size of 5' to 8' tall. To talk a little bit more about stressed plants, it's almost standard practice in the nursery trade. Think about how many trees being sold are taller than you are and yet they sit in pots where their root structure is little more than the size of a basket ball. Ideally you should grow everything from seed, or at least only plant things that are about knee high, so the root structure is more evenly balanced with the top growth. Time is the issue though as many of those potted trees are likely 5 to 10 years old. 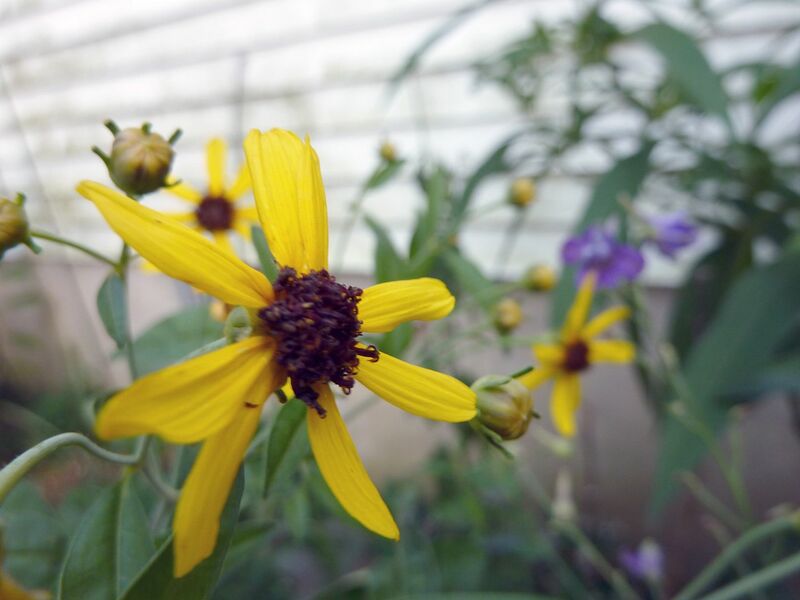 The flowers to Tall Coreopsis aren't very showy, but frankly that's normal for a Coreopsis. The real show will hopefully happen next year when the plant isn't as stressed. Tearing out some of the tangled roots before planting encourages them to grow out and get a firm grip on the surrounding soil. Next year they should reach 5' to 8' tall and flower much more heavily. I have a Perennial Sunflower planted right next to this one (not in the photo) and the contrast of flower size should be neat to see. 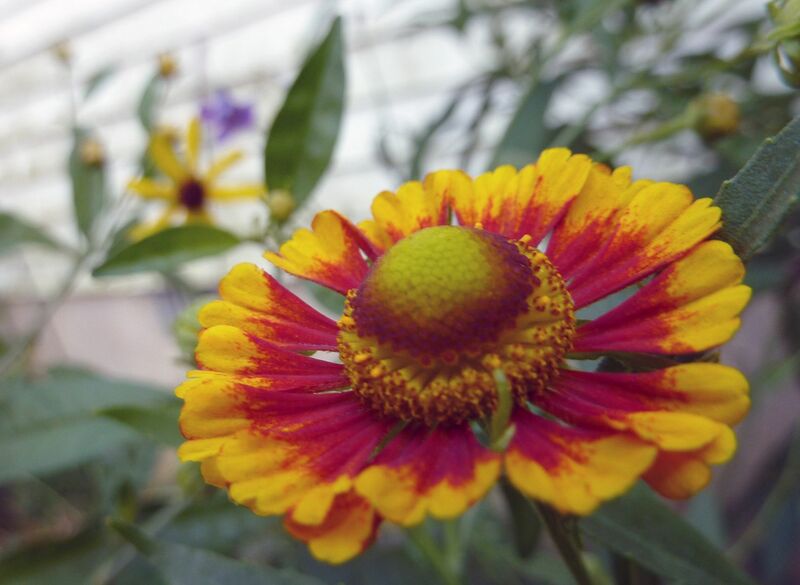 Also flowering now is Sneezeweed. I can't remember why I bought this plant honestly. I've never been happy with the amount of pollinators on it. I hate the red ring around the flower, it really annoys me when plants have this. I'd rather the bloom be totally red or not at all. Red is to showy of a color and it can easily contrast with green in irritating ways. It's not that I hate red flowers, but it's the hardest flower color to ignore and can be very distracting when seen in the background. It just takes the eye off the focus, say a butterfly on a flower... on and then there's that big red glob in the background. I'd get rid of the thing but it's filling in a bare spot and nothing seems to survive very well there anyhow. I used to have a totally yellow form but it seems to have died off. 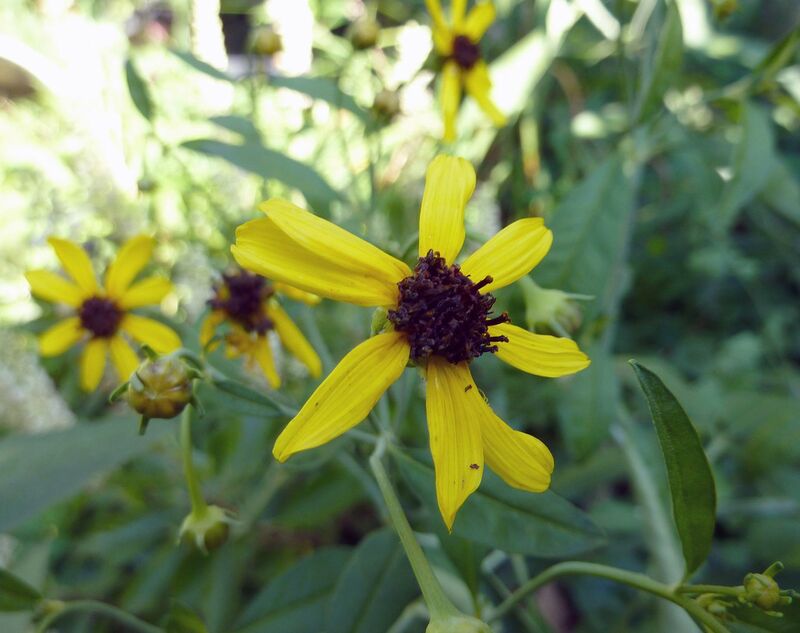 Black-Eyed Susans, Rudbeckia hirta, are also flowering finally. 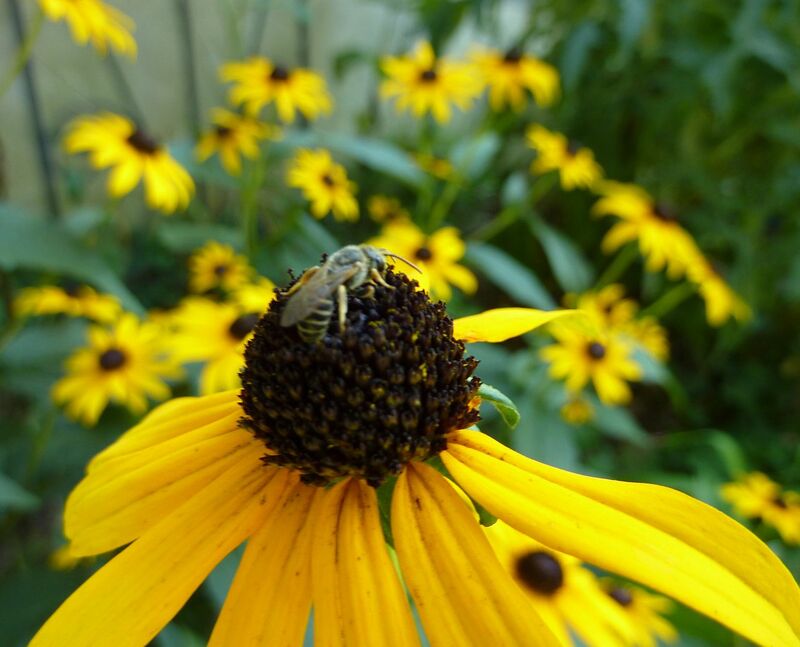 In the past I've listed this on plants honeybees love. I still stand by that but I really need to stress the following: You need a field, like a 10' by 10' area of just this plant (and maybe related or similar flowering species) all in bloom to really get honeybee attention. They otherwise ignore it completely along with most other pollinator. This little sweat bee (right?) so far is the only thing I've seen working the flowers all year. I know something likes pollinating them because they keep coming back year after year. Black-Eyed Susans are biannual! The nonflowering leaves poking out of the ground are next year's blooms waiting to happen. Occasionally there is a perennial in the mix but those aren't the standard. What's great about this plant is it's a pioneer species. The seeds germinate in response to sunlight so you'll find this plant reseeding itself where there are bare patches of soil. If there's to much organic matter laying about then this species slowly dies out in the field. After a good swift burning all the plant debris shrivels up into ash and allows more light to hit the soil. Within two years they're back at it flowering in all their glory. Of course if you're haying the field once a year, that is removing your lawn clippings instead of mulching them back into the land, then they don't really go away. Generally they're one of the easier plants to spread around by seed. After the plant pretty much dies back and you're left only with the dead stems, cut off a few seed heads and sprinkle their contents about in open bare soil in a full sun location. Next year if they germinate you should be able to see a leaf or two poking out of the soil, and the year after that they should be of flowering age. Some seeds won't germinate until the next year, so you'll get fluctuation in how lush and full their patches are unless you keep at it reseeding them around. As far as nectar and pollen go, you'll get far more interesting things happening with Sunflowers, Liatris, Coneflowers, and many others. It's just nice to have a few plants not covered in bees now and again. Some Fritillary Butterflies use Rudbeckia as a host plant as well, though it's vital to their populations to leave the plant stems where they are until next spring. The caterpillar pupa over winter on the stem and preemptive burning or mowing can decimate their population locally.